A second beer in the 8s series of IPAs. Equinox was brewed a couple of weeks ago. Eureka is right on it’s heels. Eureka is another new hop that needs investigation. The 8s will be a series of beers that I will be home brewing as a single hop beer. The goal of the group of beers is to get more acquainted with a single hop, more specifically ones that I have never used, typically newer varietals. The second goal is to push the envelope of the base grains to be more in line with the latest grain bills that are being used in the best APAs and IPAs. 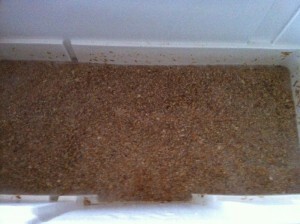 Therefore the grain bill will not change from beer to beer, just the hops and possibly the yeast. I expecting some great things from this hop. If it lives up to the description, the last eight ounces will not last long. Enjoy! 2016-02-15: At 61*F. Fermenting slowly. Put on heat jacket at 68*F to finish out fermentation. 2016-02-20: Took off heat jacket. 2016-03-03: Dry hopped with 3.0 ounces of Eureka. 2016-03-08: Bottled with 4.0 ounces of priming sugar and 2.0 cups of water. 27, 22 ounce bottles. Bottle crown label: 8Eu. Useless Fact: There are more plastic flamingos in the U.S that there are real ones. This entry was posted on Sunday, February 14th, 2016 at 2:12 am	and is filed under Beer Recipes, Home Brewing. You can follow any responses to this entry through the RSS 2.0 feed. Both comments and pings are currently closed.